Child friendly places for afternoon tea in North Leeds and City Centre. Perfect for a celebration or a one-off treat our afternoon teas have been carefully developed with kids in mind – giving them chance to enjoy the novelty of an afternoon tea, while still having time to explore our farm and play areas. Afternoon tea must be pre-booked and costs £7.95 per child. Farm admission is not included and must be paid in addition depending on time of arrival. Children’s afternoon tea includes a small milkshake, cordial or hot chocolate, A selection of sandwiches & crisps, A chocolate dipping pot with marshmallows, strawberries, grapes and brownie pieces. £7.50 per child. Open from 8.30am – 3pm, can arrange a later for after school if required. Relax, unwind and sit down to a mouth-watering English afternoon tea in the elegant surroundings of stunning restaurant. Set within nine acres of landscaped gardens, it’s the perfect setting to relax for an afternoon of leisure and tasty delights. Enjoy a quintessential English experience, including scrumptious traditional finger food washed down with ample coffee or Yorkshire tea. Afternoon Tea is available Monday – Thursday from 1pm (24 hours booking required) with an introductory offer at £8.50pp. You get an array of sandwiches, cakes and the traditional scone, with a choice of Tea or Coffee, including decaf or herbal. It is designed to be shared between two but can be made for one if desired. (Vegan Afternoon Tea available). Read our full Mumbler review here. A Selection of Finger Sandwiches, Savoury Pastry, A Homemade Fruit Scone with Butter, Jam, & Clotted Cream and a Selection of Delicate Cakes & Pastries. Includes a pot of tea or an Americano. A nice little deli with friendly staff. Delicious cakes and good coffee, just right for afternoon tea. Serve a Cream Tea and Afternoon Tea, including freshly baked scones with devonshire clotted cream and strawberry preserve. With a selection of finger sandwiches and homemade sweet treats. Enjoy a selection of coffee or loose leaf teas from ‘ Taylor’s of Harrogate’ or add a cocktail or glass of fizz. Afternoon Tea is available every day, subject to availability and special events. There are 3x time slots: 12-1.30pm, 1.30-3pm, 3-4.30pm. Prices are £25pp for members and £45pp for non-members. Minimum booking for 2 people per booking. 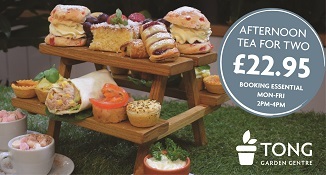 Children’s Afternoon tea in the Terrace Café is £15 for members and £25 for non-members. *Non member tickets include freedom access to the House, Grounds and Gardens on the day of your visit. *Members must present a valid membership card at Visitor Reception to gain entry to the House and Grounds. Serve traditional afternoon teas, with bespoke and themed options available throughout the year. Traditional Afternoon Tea and Cream Teas. Also do a little ones Afternoon Tea for the under 12’s. Recently introduced a Gentleman’s Afternoon Tea which is fast becoming a favourite with those who prefer to avoid tea and cakes and just stick with a good ole Yorkshire bottled beer together with a locally produced growler (pork pie), pickle, plain crisps (with a salt bag just like you got back in the day) and a selection of traditional filled finger sandwiches. A boutique tea room and home of simply scrumptious Yorkshire cupcakes and afternoon tea! Featuring a selection of yummy sandwiches, scones decadently topped with lashings of cream and champagne and strawberry jam and an assortment of tempting cakes. As well as a range of coffee and tea they also serve amazing hot chocolates complete with cream, marshmallows and chocolate chip toppings! Afternoon Tea in The Garden Room- Enjoy afternoon tea with a view – overlooking the beautiful Roundhay park. Mini version for children and Gluten Free options available. Enjoy a traditional afternoon tea with a selection of open sandwiches, scone with jam and clotted cream, homemade mini desserts and a pot of tea or Americano for £10.00 per person. Afternoon Tea at Oulton Hall is unlike any other, it’s Afternoon Tea in Yorkshire which is a very fine dining experience indeed; not least for the main ingredient itself – the tea! Our wonderful tea connoisseurs, Taylors of Harrogate, have scoured the world for over 125 years to bring the finest tasting tea and coffee across the land. These teas are carefully selected to compliment the full array of sandwiches, cakes and scones including jam and cream. The Afternoon Tea menu at Patisserie Valerie features a variety of classic savouries, alongside scones and a selection of sumptuous patisseries as well as a wide choice of coffee. Served daily in the Conservatory, a light and airy room with a 400 year-old olive tree. Guests can take in views of the gardens. Afternoon tea includes: selection of sandwiches, cakes made by our Pastry Chef, freshly baked fruit scone, mint tea from our Kitchen Garden, Taylors of Harrogate loose leaf teas. Step back in time to the sights and sounds of the forties in our quintessentially British tearoom. We offer a warm traditional Yorkshire welcome with delicious homemade cakes, soups and a range of sandwich fillings to suit all tastes, including vegetarians, vegan and gluten free. A modern twist to the traditional afternoon tea. If you are looking for a decadent, sweet and bubbly afternoon, you’ve found just the place at the Sky Lounge. The Sunshine Bakery offers a delicious selection of homemade cupcakes and brownies, breakfasts, lunch and their famous afternoon tea. Cakes and scones are freshly baked in house using local artisan preserves, and served within the grandeur of Swinton Park. Enjoy a delicious afternoon tea from £9.95 per person including, sandwiches, pastries and homemade cake served with tea or coffee. Children can enjoy the craft corner whilst you enjoy your afternoon tea!. A family run business, with a lovely cottage garden to eat in. Choose from a traditional afternoon tea of sandwiches, homemade cakes & scones and cream or our Gentlemen’s tea, served with pork pie, fruitcake and cheese. Both options come with freshly brewed tea or coffee. Children’s Afternoon Tea also available. The Bar & Kitchen offers a warm Yorkshire . Offer traditional Afternoon Tea and a Cream Tea. North Star Roast coffee is freshly ground to order, also serve Yorkshire Tea, or loose-leaf tea supplied by The Bird House Tea Co.
Their Afternoon Tea menu includes a selection of finger sandwiches- smoked salmon and crème fraiche, accompanied with delicious home baked scones and an array of sweet treats. Traditional afternoon tea available, including a selection of sandwiches, choice of two cakes, scones with jam and clotted cream.